Has an SRB been considered for use in orbit to launch to escape velocity? Has an SRB been considered for use in orbit to launch to escape velocity to deep space? Consider SRB disposable and deep space vehicle continues on liquid propulsion. SRB conserves liquid propellants for later orbit maneuvers for deep space vehicle. 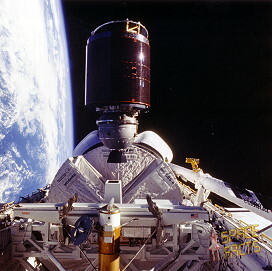 The Inertial Upper Stage (IUS), originally designated the Interim Upper Stage, was a two-stage solid-fueled rocket upper stage developed by Boeing for the United States Air Force beginning in 1976 for raising payloads from low Earth orbit to higher orbits or interplanetary trajectories following launch aboard a Titan 34D or Titan IV rocket, or from the payload bay of the Space Shuttle. A pertinent search phrase would be "solid upper stages." The PAM-D was another solid fuel upper stage used on the Space Shuttle and Delta II launchers. For the Shuttle application, one or more PAMs were carried in cradles in the payload bay. They were spring launched out of the bay, as in this picture, and the SRM ignited at a safe distance. Not the answer you're looking for? Browse other questions tagged deep-space srb or ask your own question. How were vibrations supposed to be handled in an Ares I? Was there ever a non-sterilized probe sent to a celestial body? Why wasn't the space shuttle fully Liquid fueled? Final results on Space Shuttle SRB reuse goal?